“People out there know more about it than we do here. The information is not getting to us,” José Ferreira da Silva said downheartedly, the father of a worker who is still missing after a Vale dam broke a week ago in Brumadinho, Minas Gerais. The official death toll on Wednesday reached 99, while 259 people were still missing. Josué Oliveira da Silva, José’s son, worked as a welder for an outsourcing company that provided services to Brazil’s mining giant Vale. He turned 27 years old two days before the dam collapsed, pouring thousands of metric feet of muddy ore waste over miles and miles, swallowing communities and leaving a trace of death and destruction. Six days after the tragedy, his body was still missing. 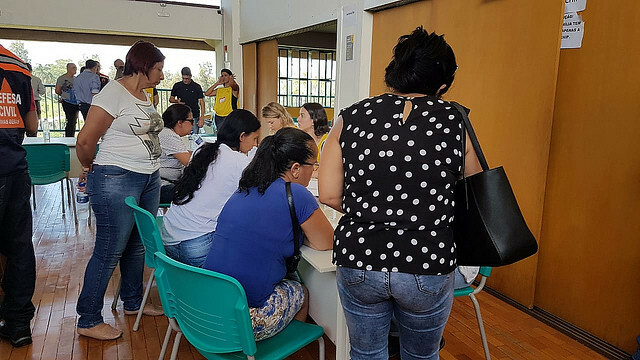 Since the dam burst, José’s routine includes going to the “Knowledge Station,” a cultural-center-turned-help-center to support the families of victims in Brumadinho. All he needs is information – any information on his son’s whereabouts. Francisco Adalberto Silva is another local who is hoping to hear news about his son, Franciserik Soares Silva, and his nephew, Luiz Paulo Caetano. The two were also hired by an outsourcing company and were performing maintenance of a tractor at Vale facilities. Franciserik’s father told Brasil de Fato that he spoke with people who were wearing Vale volunteer tags, but learned that some of them were employees who were told by the company’s own human resources department to identify as such. The grief felt by Eliane de Souza is different from that felt by those who eager for information. On the fifth day of searches for survivors, she received the news that her husband’s body was found. Forty-seven-year-old Reinildo Aparecido do Nascimento worked at Vale’s local office. “I think he didn’t even get the chance to rush out the room,” the widow said next to her 14-year-old daughter at the Knowledge Station, where they were given instructions regarding Reinildo’s funeral. Eliane said families should have the right to mourn the loss of their loved ones and hopes rescue crews will keep searching for the bodies to identify the victims. In her case, Reinildo was the breadwinner and now her family will have to depend on assistance to survive. Vale employees were also coming to the Knowledge Station looking for information about colleagues, but said the company’s lawyers told them not to speak to reporters.